It’s that time of year again, when for 10 days something interesting happens in Nebraska: the College World Series. Two groups of four teams play a double-elimination round to set up a best-of-three championship series. Some of the players you’ll get to know over the coming days will go on to play in the grown-up World Series in a few years, while others will go pro in something other than sports. There will be drama, laughter, and tears. And some pretty horrifying uniforms, though with Pepperdine and Louisiana losing in the super regionals, believe me when I say it could have been a lot worse. This year is particularly interesting as a string of upsets left this field wide open: Only one of the eight national seeds even made it to Omaha. So let’s get to know the combatants. This is going to be the fan favorite in Omaha. Irvine’s a fairly notable program, with five players drafted this season and a College World Series appearance in 2007. It is the only non–power conference team left, and a genuine bubble team that nearly missed the field altogether. There’s a team every year that runs around in the dugout like it’s a gymnastics class for 6-year-olds — Mississippi State did last year — and that’s Irvine in 2014. Several of their players grew mustaches. They’re named the Anteaters. They play a strange brand of baseball. They call it small ball, but it’s really just suicidally aggressive baserunning. Get on base however you can, and don’t stop running until there’s a man with the ball standing on the next bag. It’s a style of play unlike anything you’ll see in the pros. Key Player: RHP Andrew Morales. The two-time All-American went no. 71 to the Cardinals in last week’s draft. His complete-game shutout against Oklahoma State punched the Eaters’ ticket to Omaha. Morales, who’s tied for the Division I lead in strikeouts, and lefty Elliot Surrey combined to pitch 16 of Irvine’s 18 super regional innings and did not allow an earned run between them. 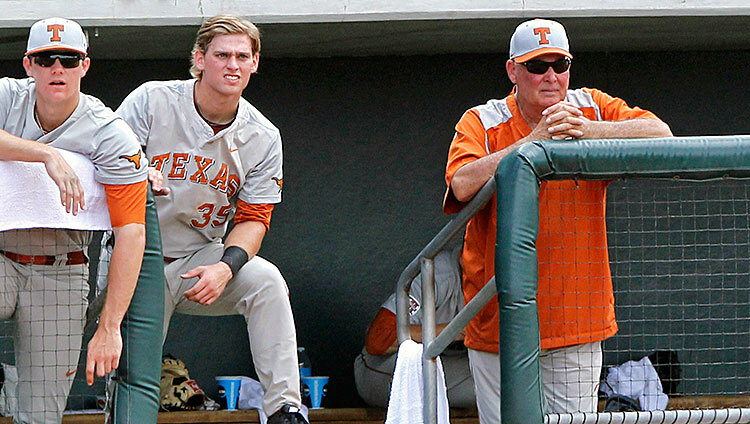 Not many college baseball coaches reach the legendary status that 75-year-old Augie Garrido has earned. Garrido won three College World Series titles with Cal State Fullerton in three different decades. Then he tacked on two more with Texas. This is Garrido’s eighth trip to Omaha in 18 years in Austin, and sometime early next year, he’ll become the winningest coach in college baseball history. Garrido’s managed a long time, and he manages a lot. His Longhorns have executed 96 successful sacrifice bunts this year, about one and a half per game. That’s a preposterous number in a league that uses the DH. The Longhorns’ OBP (.362) is also higher than their SLG (.360), which is unusual and speaks to an overall lack of power in the lineup. Still, Texas had the sixth-best ERA in the country this year and hasn’t allowed more than three runs in a game all tournament. Player to Watch: RHP John Curtiss. Really, this could be anyone on that outstanding staff, but Curtiss, a big, bespectacled redshirt sophomore, is the anchor of the Texas bullpen. Curtiss went in the sixth round of the draft to the Twins after missing 2013 with Tommy John surgery. In three NCAA tournament appearances, he’s allowed a grand total of one baserunner. The only repeat team from last year’s College World Series, Louisville hasn’t had to break a sweat in its return bid. It hosted a regional and won all three games by three runs or more. Then, when Florida State lost its own regional without winning a game, Louisville was able to host upstart Kennesaw State and won both games. Louisville’s got a great no. 1 starter in Kyle Funkhouser and plenty of bullpen depth, including Nick Burdi, the hardest-throwing pitcher left in the tournament. It has caught some breaks to get back to Omaha this easily, but it has a good team too. Player to Watch: OF/LHP Cole Sturgeon. Sturgeon is one of Louisville’s key table setters, with a .331 batting average and a very good outfield arm, which he occasionally uses to pitch. Sturgeon made 25 relief appearances this year, striking out a batter an inning en route to a 1.98 ERA. Vanderbilt had something of an up-and-down season in conference play, but has stormed through the tournament. In the NCAA tournament, and College World Series in particular, teams often find their pitching staffs stretched to the breaking point. That’s not a problem for Vandy. In the more compressed schedule at Omaha, going to the bullpen early can result in a chain reaction that leaves a team scrambling for competent arms down the line. Head coach Tim Corbin moved closer Carson Fulmer to the rotation midseason, which you can do when you have four other relievers who posted an ERA below 2.00 in 20 innings or more. Player to Watch: RHP Tyler Beede. A two-time first-round draft pick and the highest-drafted player in Omaha, Beede is absolutely the most talented pitcher left in the postseason. However, he didn’t even come close to meeting expectations this year, thanks to issues with his command and a tendency to go to pieces at the first sign of trouble. He’s also recorded a rap track under the name Young Beedah, which … I mean, I guess you can go listen if you want to. I haven’t, because I’m too scared. He’s truly a pivotal player. If good Beede shows up, I think Vanderbilt cakewalks to the championship series. If not, the Commodores will have one foot in the grave. In six tournament games, the Red Raiders have allowed four total runs, and their last four wins have been shutouts. But if we’re being honest, that probably has a lot to do with playing Bethune-Cookman and College of Charleston. Texas Tech is going to have a tough time making it out of this bracket. Player to Watch: 1B Eric Gutierrez. Gutierrez and teammate Adam Kirsch both have double-digit home run totals and slugging percentages over .550. But they’ll have to contend with the outstanding TCU and Virginia pitching staffs, as well as TD Ameritrade Park. Inaugurated in 2011, the home of the College World Series is one of the most extreme pitchers’ parks in the game. It’s almost impossible to hit the ball out to center, and Texas Tech’s hope of pulling off an upset rests on Gutierrez and Kirsch being able to contribute without putting the ball out. 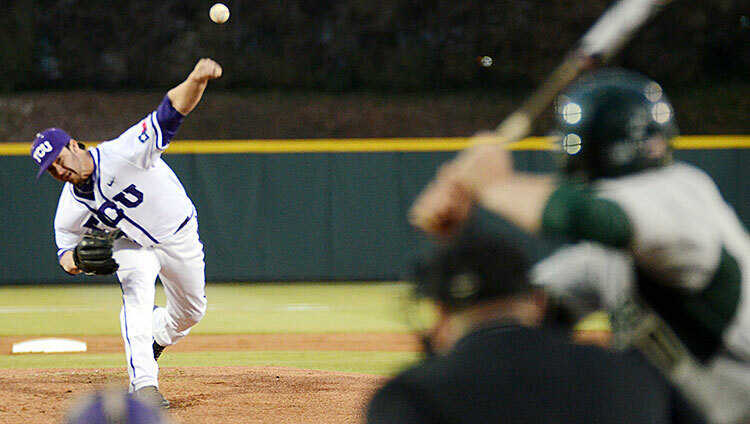 TCU has the lowest team ERA (2.19) and the second-best K/BB ratio (3.78) in the country. Two of their pitchers were Baseball America All-Americans, and one of them, Brandon Finnegan, went no. 17 overall in the draft. It’s all about run prevention. TCU also had a rough time getting here: It survived a 22-inning Greek tragedy of a regional game against Sam Houston State, then played a brutal super regional against Pepperdine. All three games were decided by one run, and TCU won the deciding game after trailing in the top of the ninth. Player to Watch: RHP Preston Morrison. Finnegan’s the big pro prospect, but Morrison led the team with a 1.32 ERA and 122⅓ IP. With Finnegan’s shoulder already giving him problems this season, Morrison might need to be the guy who goes out and gets the Frogs a shutout. He’s already had two in 17 starts. Ole Miss can flat-out hit. The Rebels have good arms, sure, but they had eight players who hit .290 or better, plus a handful of intimidating bench bats, including freshman Colby Bortles, brother of Blake. He’s one of the biggest 19-year-olds I’ve ever seen. Ole Miss also runs quite a bit, with 90 stolen bases in 120 attempts. A Mississippi-TCU matchup, for instance, would make for an interesting contrast of styles. Player to Watch: C Will Allen. The team’s senior captain, Allen hit .345/.382/.513 in a brutal SEC schedule. He’s big, he’s strong, he’s fun to watch, and he’s got a really nice head of hair too. Virginia was Baseball America’s preseason no. 1 team and one of only two surviving national seeds. It’s got to be the favorite based on talent, with three first-rounders and eight players drafted overall, but the Wahoos have a habit of stumbling around here. They’ve been a national seed in four of the past five seasons, but they’ve gotten two super regional losses and a national semifinal loss to show for it. If they play their best, they’ll win, particularly considering how wide-open the rest of the bracket is. But that’s a big if in a two-week tournament. Player to Watch: OF Derek Fisher. No, not that Derek Fisher. The no. 37 overall pick, Fisher is a 6-foot-3, 210-pound lefty who sure looks like a baseball player, but he missed 25 games this year and only hit .285/.347/.404, which is fine, but UVA was hoping for better. Watch him not only because he could be on the Astros in a couple of years, but because if Fisher breaks out, it could swing the championship.